Do you listen better when your hands are busy? If so, our Comfort Stitchers group invites you to participate in a new project, “Scarves in the Pews”. 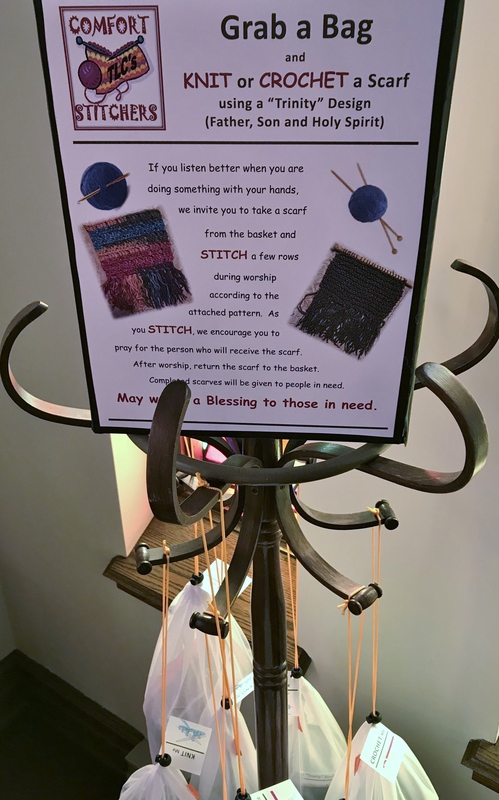 If you knit or crochet, look for the appropriate bag on the clothes tree in the back of the sanctuary. Take the bag to your seat, stitch a few rows during worship (according to the provided “Trinity” (Father, Son and Holy Spirit) pattern) and after worship return everything to the clothes tree. When your scarf is completed, place the bag by the church mailboxes. All completed scarves will be distributed to people in need. See Sandy Christian with any questions. 2 Comments on "Scarves in the Pews"
Our group meets the first Monday every month, Sept – June. I’ll forward the request to the group.